JWT has just added this set of adjustable VQ exhaust cam gears for engine builders intent on gaining the most out of a VQ35 or VQ40 engine, turbo or NA. 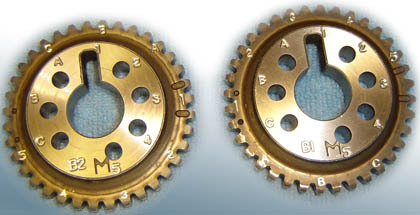 With eight positions of 2.5 crank degrees each, these gears allow enough adjustment to span a full tooth if needed for infinite cam timing corrections. The gears open up many possibilities like converting Revup engines to run in DE configuration, resetting exhaust cams after altering crank sprocket timing, and just being able to easily explore all cam timing options. Pictures may not be the exact item. Please see our policies before ordering.